Whether you’re out on the road for weeks at a time meeting with clients, just popping into the city for a weekend conference or taking the family on a hard-earned vacation, a few well-chosen applications can turn your BlackBerryfrom a communications tool into a road warrior’s productivity powerhouse. You can track expenses, mileage and business calls; find the perfect places to stay, eat and work; keep on top of your travel arrangements; and even call on a virtual concierge to handle last-minute changes of plan — all from the comfort of your BlackBerry’s familiar screen. WorldMate gives you convenient access to all the details about your upcoming trips. Keep all your travel details readily accessible with WorldMate Live, an itinerary manager packed with useful features for frequent travelers. All you have to do is forward your airplane, hotel or car rental confirmation e-mails to WorldMate; the service parses out the relevant details and makes it all easily available. Additional features in the free “lite” version include location-based search (using Yelp), currency conversion, hotel and limo booking, world time and the ability to search for local LinkedIn contacts. The paid Gold version ($11.95/month, $99.95/year) adds flight status lookup, “push” text alerts for flight delays, and a travel directory with contact information for airports, airlines, hotel chains and rental companies. 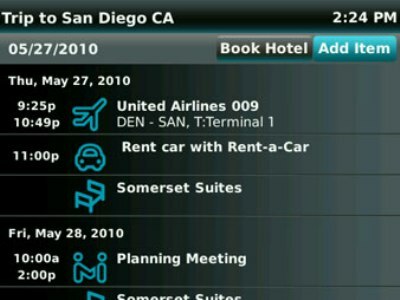 Track travel expenses by client or by project with Exgis’ BlackBerry interface for its Web-based service. With customizable currencies, locations and expense types, Exgis Time & Expense Enterprise lets you quickly enter expenses, mileage or time spent working on a task, and associate each entry with a specific client or project for billing. Online reports can be generated that list expenses by month, client or specific project, or all your data can be imported into Inuit’s QuickBooks 2008. A 15-day free trial is available; after that, Exgis Time & Expense Enterprise is $10 a month or $110 a year. If you do not need the advanced options offered by the enterprise option, such as the ability to sync to a corporate server, there are lower-priced single-function programs for expense, time or mileage tracking ($4.99 each), as well as Exgis Time & Expense ($9.99 for the Lite version without mileage tracking, or $14.99 for the Pro version, which includes mileage). Poynt’s gorgeous interface and color coding make it easy to use. Open up your local community, wherever you happen to be, with Poynt’s free location-search pplication. You can search for local businesses (by name or type) and people, research restaurants, search for movies by title or theater, and find the closest gas station or the one with the cheapest gas (which could prove to be a real lifesaver if gas prices climb over the summer). 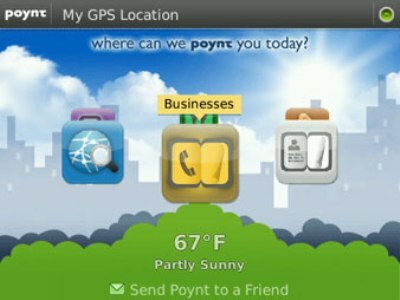 Poynt integrates with your BlackBerry’s phone and mapping features, making it simple to find a place or to call one you’ve already located. It also uses third-party services such as OpenTable to make restaurant reservations and CinemaSource to buy movie tickets. These services can be somewhat hit-or-miss, since only a limited number of local businesses are covered; still, it’s nice when the stars align and you can handle everything from your phone. Urbanspoon.com is a comprehensive online restaurant review site that pulls together user-written reviews with information culled from blog posts, Twitter and professional reviews. The free Urbanspoon BlackBerry app offers a gateway to that information, but with a twist: Instead of searching for particular restaurants, Urbanspoon presents a slot-machine-like suggestion engine. Three wheels for geographic area, type of food and cost spin to present random combinations — and a restaurant that fits those criteria. You can go for broke and spin all three, or you can “lock” each wheel independently, searching for, say, Indian restaurants in your area regardless of price, or any affordable restaurant in a specific part of whatever town you happen to be in. It’s a great way to find restaurants in new cities where you have nothing on which to base a decision — and to rediscover familiar towns you’ve been to a hundred times. Make an unfamiliar town come alive with Buzzd, a free app that acts as a kind of Digg for local attractions. Users vote the places and events they go to up or down and post comments, which are integrated with information from Twitter and other social networks to give an idea of what places people are talking about. Unlike Urbanspoon, Buzzd’s strong point is not restaurants but nightlife in general — bars, clubs, even concerts and other shows. It’s a great tool for finding somewhere to relax after a hard day’s work or sightseeing, and for getting a taste of the local culture. Keep track of calls on the go with the BlackBerry version of Mobiso’s Web-based contact management platform. Contacts can be synchronized with Google or Outlook; once they’re imported, Mobiso automatically tracks call length for all calls or calls that meet specific criteria (for instance, only calls to and from people marked as business contacts, allowing you to keep your personal calls private). When you complete a call, Mobiso offers the option of adding notes to describe the conversation. Your call logs can be exported from the online service as an Excel spreadsheet or imported directly into SugarCRM (using a SugarCRM plug-in) to keep your in-office and out-of-office records together. An interesting feature is Mobiso Voice, which allows you to call into the Mobiso service and use voice commands to call individual contacts, set up conference calls or dictate e-mails. The individual version of the app is free; corporations can install Mobiso companywide with the Mobiso Enterprise service, which costs $4.99 per user per month. While apps like Poynt and WorldMate Live offer simple weather information, the free WeatherBug Direct app offers the depth of weather info you need to plan (and pack) just right. In addition to current weather conditions, WeatherBug offers a simple (highs, lows and conditions) yet fully detailed seven-day forecast so you have a good idea of what to expect when you reach your destination. It also offers an hour-by-hour forecast so you’ll be prepared for each day’s weather when you leave your hotel room in the morning. When things get really bad, WeatherBug sends emergency alerts detailing the situation. MyAssist places a personal assistant at your beck and call, 24 hours a day from wherever you are in the U.S. Need to make last-minute hotel reservations in an unfamiliar town? Forgot to send flowers for Mother’s Day? Need a tow truck or medical attention? One click calls or e-mails your MyAssist expert, who can set you up with whatever you need: airplane bookings, limo reservations, golf or spa reservations, show or event tickets, translation services or even general trivia. The service is $9.99 a month, not counting the services MyAssist connects you with (e.g., you’ll still pay for the flowers that MyAssist arranges to have delivered). Translate from and to any of over 50 languages with the Navita Translator, which uses Google and Bing translation services to produce surprisingly good translations. Most input languages are automatically detected, so you just have to pick the language you want to translate to and hit Enter. Navita also remembers whatever the “translate to” language was the last time you used the program. The translation appears as text onscreen; you can also choose to have a computerized voice read it aloud — useful for asking questions in a foreign country. Navita Translator also integrates with the BlackBerry’s software so you can translate text from the Web browser or e-mail simply by selecting it and hitting the menu key. Navita Translator is free with ads; for $9.99 you can upgrade to an ad-free version (with no added functionality). Find your car with the easy-to-use CarFinder. Finding your parked car in a crowded metropolitan area can be a chore, especially if it’s a generic and unfamiliar rental. 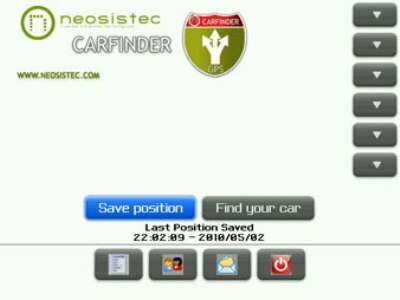 Using CarFinder is simple: Save the location of your car (using your BlackBerry’s built-in GPS) when you get out, walk to your destination, and then click “Find your car” when you’re ready to leave. CarFinder will produce a map back to your car, or use an arrow to lead you back. It’s great for finding your car in a huge airport parking lot or busy shopping mall, too — or finding your way back to the hotel after a long sightseeing stroll.